Google “Promoted” search results are…..terrible. WSJ has a new long, wonky article about web traffic that is just the sort of thing I love. And, like a lot of news about our online ecosystem, it’s a bit depressing. 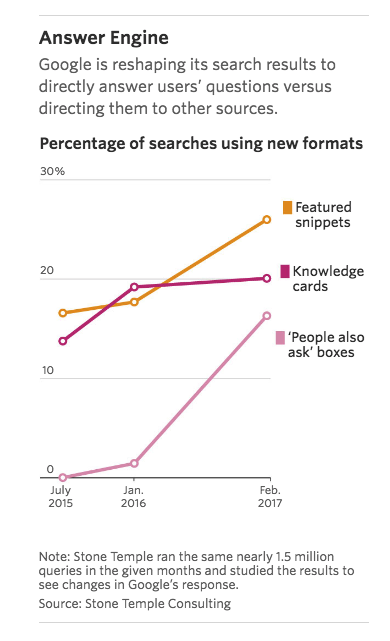 When you search in Google, it often puts “featured snippets” or “knowledge cards” at the top of the search results. You may also see a list of similar questions under “People also ask.” The problem is that the answers are sometimes bogus, and sourced poorly. “A study this year by Stone Temple, a prominent analyst of the industry, showed Google’s search engine answered 74.3% of 5,000 questions, and on those answers it had a 97.4% accuracy rate. Both percentages are higher than services from AmazonInc., AppleInc. and Microsoft Corp.
I’ve certainly seen this in action in queries about insect identification or pest control. Here’s an example: Suggestions for controlling fire ants. Gasoline and grits! That will end well. Note that there is a tiny “report inappropriate predictions” box in the lower right corner — so this is an opportunity to tell Google that Kill It With Fire Is A Terrible Idea. Let’s say you search for fire ants and grits; a common home remedy. 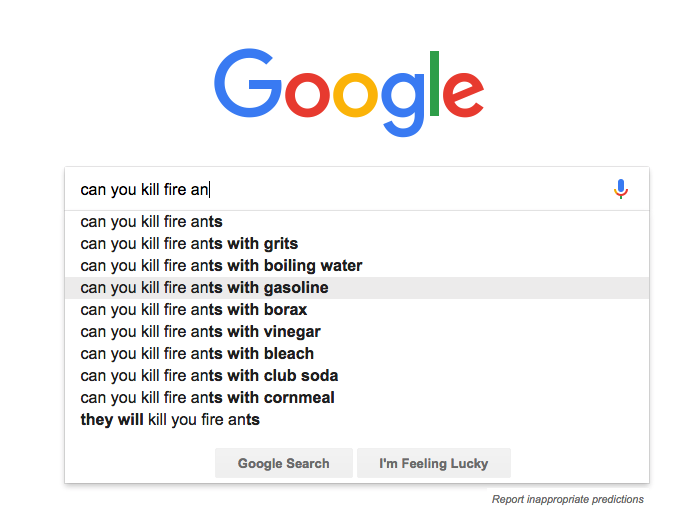 The featured snippet tells you that instant grits will kill fire ants. NOPE. Note that again, there’s a tiny little feedback link at the bottom right of the Knowledge Card. Give feedback on both good and bad results for entomological results! Help Google do better. 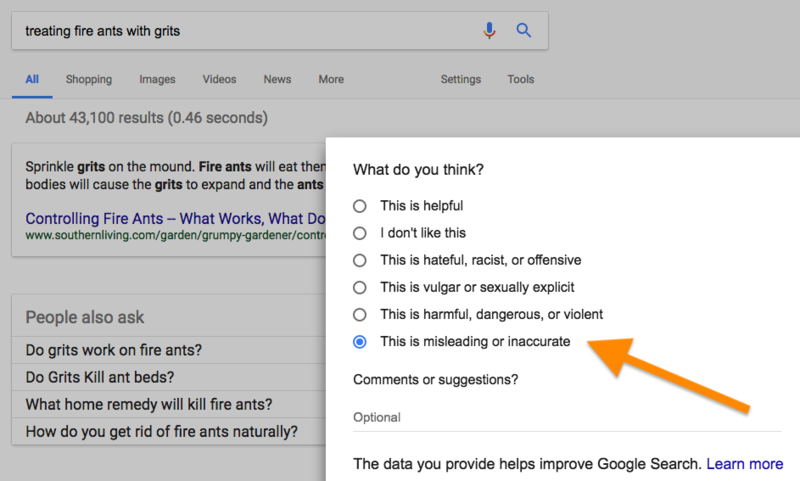 Google gives priority to responses that have detailed comments about why the suggested information is wrong, and links to better, more authoritative resources. So the next time you search for something and get terrible results, take action!